APL announced on 31st October the enhancement of its Asia- Subcontinent network with the Asia Subcontinent Express 6 (AS6) and Asia Subcontinent Express 7 (AS7) services. The AS6 service will call at Shanghai, Ningbo, Shekou, Nansha, Singapore, Port Klang, Nhava Sheva, Karachi (SAPT) and Singapore once more before returning to Shanghai. The first sailing of the AS6 was scheduled to depart from Shanghai on 15th November. The AS7 service was due to commence from Shanghai on 14th November with calls at Shanghai, Ningbo, Fuzhou, Shekou, Singapore, Port Klang, Colombo, Karachi (KICT), Karachi (PICT) and Mundra before revisiting Port Klang, Singapore and Shanghai. Containerships announced on 1st November that a second service will call at London Thamesport from Gdynia, Poland. The service offers regular and fast connections with Poland, with improved transit times from Gdynia of 3-4 days and 4-6 days for the return journey. CMA CGM’s third and final 20,600 TEU capacity newbuild, the 217,673gt/2018 built Louis Bleriot (above), was delivered in October by Hanjin Heavy Industries & Construction, Philippines. The 400m long and 59m beam ship was named after Louis Charles Joseph Blériot, the French aviator, inventor and engineer. 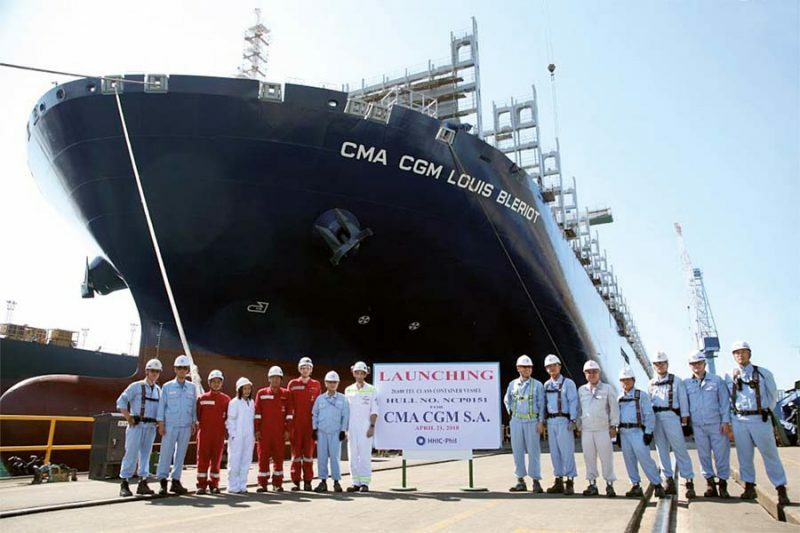 Her two sisterships, CMA CGM Jean Mermoz and CMA CGM Antoine de Saint Exupery, were delivered in January and May 2018. The company announced on 26th October that it was planning to reshuffle its Mediterranean-Middle East Gulf-Indian Subcontinent services, MEDEX, MEGEM and INDIAMED as from Week 46 from the Middle East. The trio of services employ a total of 21 vessels. The MEDEX route employs 8 vessels making 17 calls on a 56-day rotation, namely Jebel Ali-Karachi-Nhava Sheva- Mundra-Jeddah-Malta-La Spezia-Genoa-Valencia-Barcelona-Fos- Genoa-Malta-Damietta-Aqaba-Jeddah-Hamad-Jebel Ali. The revised service commenced on 10th November with the 88,493gt/2002 built Ningbo Express. The MEGEM service employs 6 vessels making 15 calls on a 42-day rotation, namely Jebel Ali- Hamad-Dammam-Jubail-Jebel Ali-Jeddah-Port Said West-Mersin- Piraeus-Izmir-Ambarli-Aliaga-Iskenderun-Damietta-Jedda-Jebel Ali. The new port sequence commenced on 30th October from Jebel Ali care of the 70,704gt/2015 built UASC Yas. Finally, the INDIAMED route uses 7 ships making 14 calls on a 49-day rotation. The ports served are Jebel Ali- Hamad-Jubail-Jebel Ali-Mundra- Nhava Sheva-Colombo-Port Said West-Mersin-Piraeus-Ambarli- Mersin-Iskenderun-Jebel Ali. The first ship to undertake this circuit was the 95,390gt/2013 built MSC Alghero, calling at Jebel Ali on 16th November. On 31st October the CMA CGM Group completed the acquisition of Finland-based container-transportation and logistics company Containerships. Founded in 1966, Containerships specialises in Intra-European containerised trade with 690 employees. The announcement followed the go-ahead for the merger from the European Commission on 22nd October. The transaction includes four 1,400 TEU capacity vessels powered by LNG. These vessels will be followed from 2020 onwards by the nine 22,000 TEU and two 1,400 TEU capacity containerships ordered by the CMA CGM Group. COSCO Shipping’s 215,553gt and 21,000 TEU capacity containership COSCO Shipping Nebula was named and delivered on 23rd October at Jiangnan Shipyard (Group) Co., Ltd. The giant vessel is 400m long with a beam of 58.6m, a moulded depth of 33.5m, a maximum draught of 16m and a design speed of 22 knots. The ship’s maximum deadweight is 198,000t and the maximum capacity is 21,237 TEU. The ship will serve on the Far East-Northwest Europe loop (AEU3).